With the Junior World Cup serving as the pinnacle of U-21 hockey around the world, you’d be forgiven for thinking that the best players on the planet for that age group comprise of athletes at the top of that age range. Having just turned 19 in July of this year, attacking midfielder Lachlan Sharp of Lithgow, New South Wales, represents one of the youngest members of the Kookaburra’s U-21 squad to compete in Lucknow, India. Lachi Sharp posing for a sponsor’s photograph. Plying his trade at Ryde Hunters Hill in the Sydney Premier League; New South Wales’ premier hockey competition, Lachi has enjoyed a stand out few seasons, peaking in the 2015 Grand Final, where he scored the Golden Goal in Extra Time to end a Championship-drought for the club of over 50 years. His stand-out performances as a Ryde Panther and representing NSW in the Australian Hockey League at U-21 and senior level have led to his inclusion in the Burra’s squad in the build up to Lucknow and he is now relishing the opportunity to get the tournament under way. In his own understated way, Sharp is relishing the opportunity to compete overseas having missed out on the squad that ultimately won the Sultan of Johor Cup earlier in the year. The Australian U21 squad are fast getting to grips with life in Luckow, India ahead of the opening matches on December 8th. Despite the success of the squad out in Malaysia just two months ago, Sharp is very aware that Australia have a potentially tricky group to negotiate before they can set their sights on the latter stages of the competition. With Korea, Argentina and Austria drawn alongside them in Group A, the Burra’s have not only 3 tricky teams but 3 vastly differing styles of hockey to account for if they are to progress. It remains a very pragmatic approach but one that has ultimately catapulted Sharp into the World’s elite and it’s a similar mind-set when it comes to the objectives of the team out in Lucknow. “You have to embrace the opportunity you have been given”. When it comes to guidance and coaching in hockey, for Lachi, help is never too far away. His father, Richard Sharp, leads the Ryde 1st Grade squad as their Head Coach. His passionate, indomitable style of leadership is renowned around the league and a fundamental kingpin of the Ryde Championship side of 2015. Ryde HC have produced a number of Australian Internationals in recent years. The formula at the Sydney -based club is most definitely working. The contributions of Richard Sharp, along with that of Tim Collier and Larry McIntosh, former head coach of the Kookaburra’s, has helped to mould a fantastic club with extraordinary depth and elite flagship sides at First Grade level in Sydney. From that Championship winning side of 2015, Ben and Tom Craig have gone on to earn Senior International Caps with Tom travelling to Rio as a reserve for the 2016 Olympic Games. Tom now joins Lachi along with fellow Ryde team-mate Sam Liles in Lucknow to represent the U-21’s with another Ryde prospect in Tim Brand just missing out on the final selection. Having his club team-mates alongside him in the Green and Gold of Australia will always be a special moment; the magnitude of which is not lost on young Sharp. Ryde 1st Grade, led by Richard Sharp, took home the Sydney Championship in 2015 behind Lachi’s Golden Goal to end a drought of over 50 years at the club. 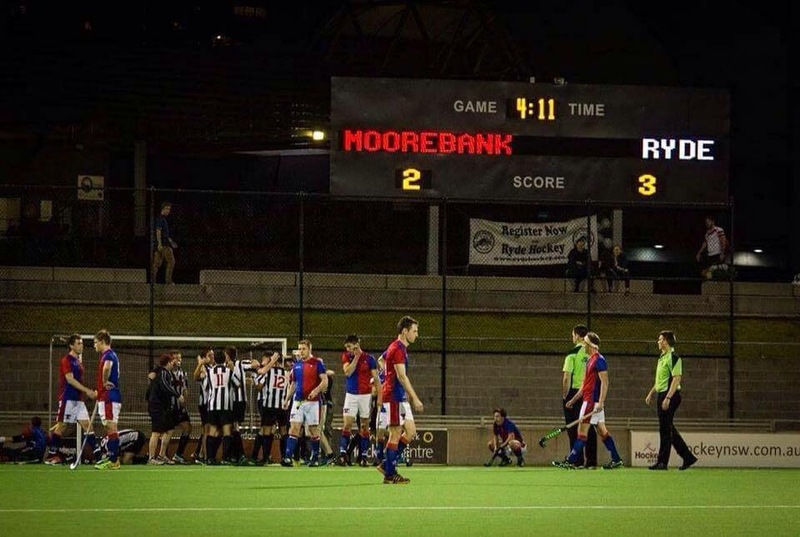 Ryde’s 2015 Championship celebrations behind Sharp’s Golden Goal. With a host of distractions surrounding the players at such a prestigious tournament, Ryde’s youngest contribution to the Burra’s JWC squad remains focused on the task at hand and the methodical approach towards realising the collective aspirations of the group. The recent recipient of the prestigious “Best and Fairest” Award for Ryde on behalf of both the club as an entity and the First Grade, Sharp has his sights set on consolidating on his meteoric-rise over the past few years before pushing for further International honours. For the time being, the platform is set and the competition is about to get underway. The last edition of the competition in 2013 has since contributed a plethora of senior Internationals from around the globe over the past 3 years, as well as providing the breakout performances of the now globally renowned, Christopher Rühr. With Kookaburra Tom Craig and Rio Olympian Blake Govers in their ranks, it would be a brave individual to bet against Australia improving upon their return in Delhi 3 years ago, where a rampant Germany side ended their World Cup ambitions at the Quarter-Final stage in a thrilling 4-3 game. For Lachi Sharp, a chance to compete on the global stage is one that he’s ready to take with both hands and as the tournament progresses, the spotlight will no doubt shine brighter on the young Ryde prospect along with the rest of his Burra’s squad. Australia open their World Cup campaign against Korea on December 9th at 10am local time. Click here to follow the Junior World Cup and keep up to date with all the news and results.